Abandoman brings hit show ‘Life+Rhymes’ to Cardiff! After entertaining over 10,000 people at last year’s Edinburgh Festival, Ireland’s top comedy hip-hop improv team and Fringe sell-out favourites Abandoman are bringing their “raucous, expansive and relentlessly hilarious” show Life + Rhymes to Cardiff’s Clwb Ifor Bach on Thursday 26th October! 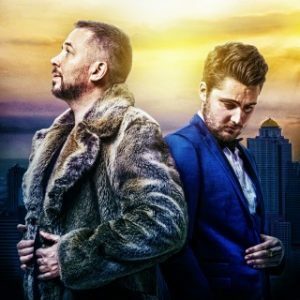 From the get-go, Abandoman (AKA rapper/comedian Rob Broderick and musician/vocalist Sam Wilson) have won a string of awards and the highest of international critical acclaim. They supported multi-platinum artist Ed Sheeran on his UK tour, performed across The USA, Canada, Australia and Asia, enthralled audiences on Channel 4’s Alan Carr’s Happy Hour and 8 out of 10 Cats Does Countdown, BBC1’s The One Show and BBC2′s The Stephen K Amos Show, guested on various radio shows from Nick Grimshaw (BBC Radio 1) to Christian O Connell (Absolute Radio) and held a song writing residency with Chris Moyles (Radio X). For this show, Abandoman bring you a fictional biopic – of epic proportions. This imaginary retrospective spans twenty years and sees the duo’s attempt to “make it” as a band in the early 90s. Not only will the audience witness the highs, lows and scandals… they will form the supporting cast every night. Over the course of the tour, Abandoman will meet rival bands, managers, fan club presidents… and numerous other roles too fantastical to conjure up before the night itself. There are no other performers quite like Abandoman! If you want to arrange one of the most fun and unique interviews of your life, hip hop this way! For more information, please visit www.abandoman.com or follow @abandoman on twitter.